ECO STYLE Luxe TopLoad Case - Laptop carrying case - 15.6-inch - blackSophisticated design will accommodate laptops up to 15.6” offering maximum protection. Dedicated tablet/iPad compartment, No need to remove laptop as checkpoint friendly feature meets TSA requirements and allows for a quick & easy x-ray scan.Workstation includes key fob, cell phone pocket, pen/pencil holders, business & credit card holders, multiple padded pockets to protect and accommodate all of your accessories. 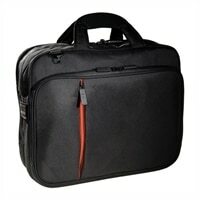 Sophisticated design will accommodate laptops up to 15.6” offering maximum protection. Dedicated tablet/iPad compartment, No need to remove laptop as checkpoint friendly feature meets TSA requirements and allows for a quick & easy x-ray scan.Workstation includes key fob, cell phone pocket, pen/pencil holders, business & credit card holders, multiple padded pockets to protect and accommodate all of your accessories.